This blog has been updated for API version v3. You may use VdoCipher API v3 to build a workflow around your video website as suggested in this blog. Complete details and Sample Codes for the API can be found in the Server API Docs. In this blog article, I’ll mention the common business use cases that generally developers use with our video streaming API. 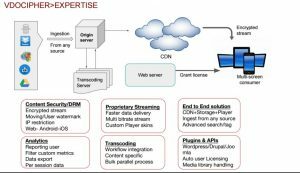 Our video APIs have been built with the express mission to automate the entire video streaming pipeline for our users, from video upload right upto video playback. The links to the new set of APIs and sample codes are also given. The complete API v3 reference, with sample codes for different backend languages, can be accessed from the API Sample Docs. We generate dynamic URLs for video streaming. This ensures that video is played only when the API server authenticates it as being a valid session. Our API server issues unique OTPs to decrypt encrypted content. These OTPs are authenticated by the license server. This combination of Encrypted Streaming and Backend authentication with OTP ensures that videos cannot be downloaded, and is the key feature we provide as part of our secure video streaming service. Please visit our API page for details on embedding videos to your website. Sample codes for OTP generation can be found in the API Docs reference. Dynamic watermarking protects your premium video content from screen capture technologies. Dynamic Watermarking enables you to display user information over the video, effectively deterring video piracy from screen capture. You can customize user details and how the text moves across the video screen by using the Watermark API. This API always delights our users, who find that watermarking obliterates any threat from piracy. To help you manage your video content we offer various options for optimal video upload. You can upload your video files directly using the Dashboard, or by using the API. The Upload API enables you to authorize your content providers to directly upload videos to your account. Videos can be uploaded from the desktop and from the server. The import API enables you to import videos to your VdoCipher account from any HTTP or FTP link. The Upload and Import APIs can be found at the API Docs Reference. Video tags are one of the key elements used for categorising videos. Managing a large library of videos requires that you efficiently use a tag-based video management system. The tag API enables users to effortlessly add, delete and replace tags, and to enable tag-based video search. The tagging API can be found in the API Docs. The Video Search API returns a list of videos that match your query. Supported HTTP queries include title, video ID, and tags. The API returns detailed list of videos, which you can return to your website for users. We have set soft rate limits for the search API. We recommend using a caching layer for your website’s general users, so as to limit the number of API calls. APIs to enable video search from names and tags can be found in the API Docs. Our APIs enable our users to create their own white-labelled front-end. Content providers can add videos to our client’s platform, which make upload and tagging API calls in the backend. Users can use VdoCipher’s video streaming infrastructure with their own user interface to retain complete control over user experience while delivering the best video experience for premium content. Enterprise customers can have their own customers upload videos directly on our site. This can be implemented with APIs using these links. This blog explains the two-step video upload process using which you can enable video uploads for content providers. After initiating video upload you can check the status through the video status API. Apart from video status, the video contains all details of the video. These include title, description, video upload time, video length, poster image URLs and associated tags. API reference for the video status API is available here. Poster image is the image that is shown to the viewer before a video is loaded. By default, a shot from the video at a random time is taken and converted into posters of different sizes. You can customize the poster image to increase click through rates for your video. You can use the API to auto upload new poster images. The complete API v3 reference, with sample codes for different backend languages, can be accessed from the API Sample Docs. Have a glimpse of the number of your viewers using video download tools for easy piracy.